Emergency placements down in Norway. Should we start to celebrate? Going by the latest official figures, emergency placements in Norway have reduced from 1,804 in 2017 to 1,583 in 2018. Should we be celebrating this reduction in emergency placements of children? Emergency placements, where children are taken away from their families unexpectedly should only be made if they would be significantly harmed by remaining at home with their parents. Emergency placements should only be used in extreme and exceptional cases, for example if there is an immediate and significant threat to a child’s health or development. One of the main reasons why emergency placements are implemented is not that the child in question is in a life-threatening situation or that the circumstances are in any way exceptional. It is usually an attempt to make an impression on the courts that something incredibly bad must have happened in the family, when in most cases there isn’t anything extraordinary or convincing enough to justify the emergency takeover. Although the Norwegian Ministry of Children, Equality and Social Inclusion asked local authorities to restrict the implementation of emergency decisions in 2008, Norway has seen a rapid increase during the nine years that followed. Since 2008, emergency decisions have been going up and down, up and down, but they have now reached an alarming high (regardless of the comparison between 2018 and 2017). In 2008, there were 945 emergency placements, which was most worrisome for the Ministry of Children at this time, and rightly so. In 2018, 1,583 emergency placements were made, and people are celebrating this? 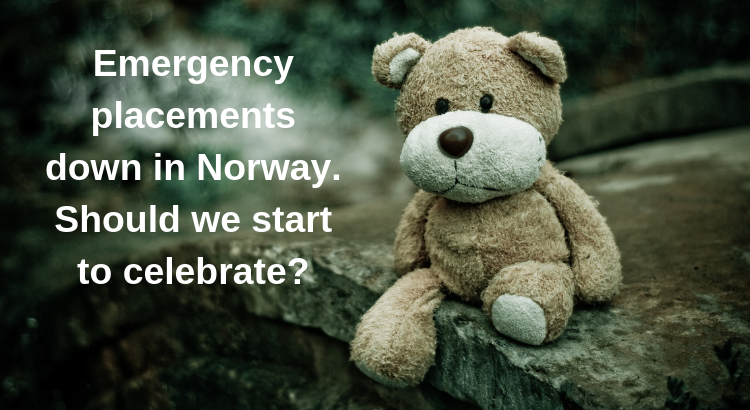 Let’s just say that emergency placements are reduced by 100 placements every year from now on; it will take at least six years before it reaches a figure that the Norwegian Ministry of Children in 2008 was very alarmed at. During these hypothetical six years, thousands of children will continue to be needlessly taken away from their families without any warning causing them incredible harm and lifelong trauma. Are these numbers really worth celebrating? Are we meant to totally ignore the fact that thousands of children will continue to be damaged and destroyed by NCWS’ use of emergency placements in the years to come? For a small country like Norway, coupled with the reasons given for why children are taken away, it could be argued that out of the 1,583 emergency placements in 2018, well over 1,000 of these placements were totally unnecessary. This is not how you treat children and the trauma they experience through emergency placements is very difficult to repair. The enormous amount of emergency placements in Norway continues to put the authorities in a position of not only breaking the law, but also of violating the basic human rights of children and parents, as the child’s rule of law is significantly reduced by the unnecessary use of emergency placements. It’s worth remembering, the abusive use of emergency placements is just one part of many dysfunctional parts of NCWS that will continue to needlessly destroy and traumatise thousands of children’s lives in the foreseeable future. Like Gro Hillestad Thune commented, a child should be protected, kept safe and made to feel secure. Let’s follow Thune’s lead and stop these unnecessary emergency placements in Norway that cause irreparable damage and trauma to children.